It’s National Nutrition Month and I could write about what foods toddlers need to grow up healthy. But the truth is there are key barriers to feeding toddlers for which most parents aren’t prepared. With the right information, parents can arm themselves with powerful strategies that improve nutrition instantly. Here’s what parents of toddlers need to know. 1. Most go through a picky eating stage (and it’s not your fault): Ah, the baby stage. I remember it well. I could chop up almost any food and my child would gobble it up with gusto. But this feeding stage doesn’t last. 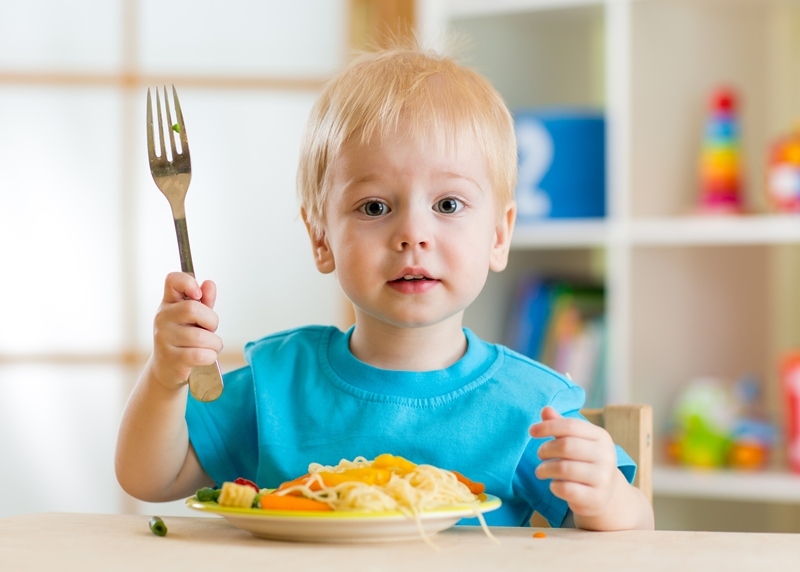 At around age two, young toddlers start rejecting foods they used to like and often start picking at food. Why? The fast growth that occurred during the first two year slows way down, reducing appetite. Toddlers also become more aware of the world around them and want some say in the matter. The good news? Research shows that by age six, picky eating improves for most kids. The key is not to cater to kids or make food a battle. International feeding expert Ellyn Satter simplifies feeding with her Division of Responsibility (DOR): Parents decide what to serve, when to do it and where it occurs and children are responsible for what and how much to eat from what is served. 2. They may start hounding you for sweets: I often get emails from parents about how their three year old has become obsessed with sweets. Kids at this age are becoming aware of the food environment. They see cupcakes and cookies at parties and wonder why they can’t eat these yummy foods all the time. Parents who are too restrictive with these foods will find their kids’ fixation gets worse over time. But being too lax about sweets isn’t good either. So think about what you want for your “sweets policy:” a consistent offering of sweet foods that your child can get on board with. For example, offering sweets at home two to three times a week (knowing they get them outside the home, too) can make everyone happy as it teaches little ones how these foods fit into a balanced diet. 3. They have small stomachs that fill up easily: Toddlers are notorious for picking at their dinner after filling up on juice, milk and snacks throughout the day. Remember, toddlers’ stomachs are about the size of a fist, so you want to be mindful of what is filling their bellies. Keep the milk to no more than two cups daily and juice to 4-6 ounces per the American Academy of Pediatrics (preferably with meals). Have kids drink water between meals and no in-between meal grazing. You’ll be amazed at how much better they eat come mealtime. 4. They strive for independence: Toddlers are learning they are a separate person and want some control, especially when it comes to food. 5. Meeting toddlers’ nutritional needs is easier than you think: Because toddlers’ eating is so erratic from one meal to the next, it’s normal to worry about nutrition. But research shows that although intake at each meal varies, calorie intake over the day is consistent. Also, compared to older kids, younger children are less likely to fall short on key nutrients, partly because they don’t need that much food. For example, the minimum recommended amount of protein foods for a two year old is two ounces. If a child eats an egg for breakfast and a peanut butter sandwich for lunch, they are already there (so mom doesn’t have to worry so much about the two bites of chicken at dinner). And did you know a variety of fruit intake can make up for a lack of veggies? If you’d like to read more about food group recommendations and how to strategize nutrition, check out this article. Feeding toddlers can be challenging, but when you see the big picture of why they eat the way they do – and how to meet nutrition needs – it helps tremendously.